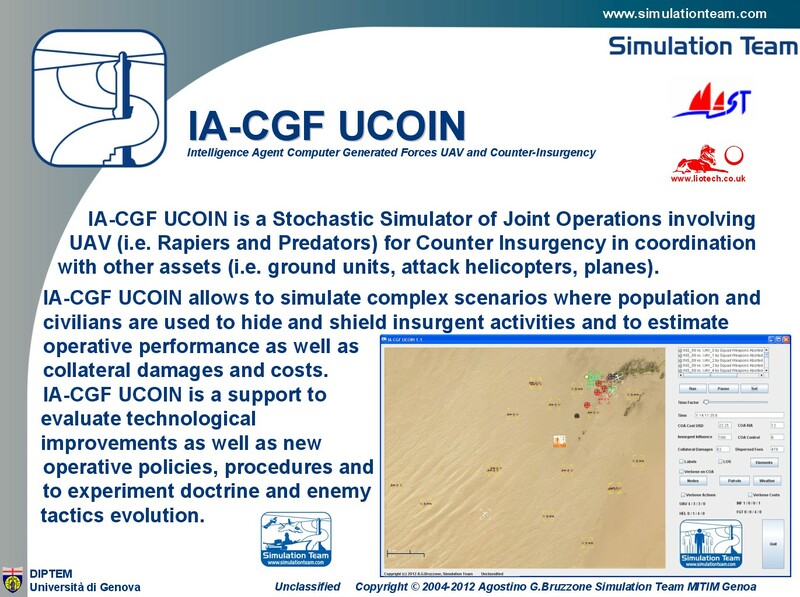 IA-CGF UCOIN is a Stochastic Simulator of Joint Operations involving UAV (i.e. Rapiers and Predators) for Counter Insurgency in coordination with other assets (i.e. ground units, attack helicopters, planes). IA-CGF UCOIN allows to simulate complex scenarios where population and civilians are used to hide and shield insurgent activities and to estimate operative performance as well as collateral damages and costs. IA-CGF UCOIN is a support to evaluate technological improvements as well as new operative policies, procedures and to experiment doctrine and enemy tactics evolution. IA-CGF UCOIN benefits of IA-CGF developed by Simulation Team.